I don't feel any jet lag at all," a woman from Colorado said to her husband while waiting for their bags to be wheeled into the Taj Holiday Village. "It must be the meditation we did on the plane." "That and the melatonin," remarked her husband. The couple's jet-lag remedies came as no surprise. We were gathered, after all, at a beach resort in the former Portuguese possession of Goa, about 400 miles south of Bombay, for a weeklong meditation retreat suavely titled Seduction of the Spirit. Small talk about alpha waves and mantras was hardly unexpected from followers of Deepak Chopra, a former endocrinologist and chief of staff at the Boston Regional Medical Center turned transcendental-meditation practitioner and author of Ageless Body, Timeless Mind and The Seven Spiritual Laws of Success. What was surprising was the very un-Indian setting. On the way to Goa, we'd all passed through Bombay, the smoggy megalopolis of a port, renamed Mumbai for nationalist reasons. There we'd received an eyeful of the sort of kaleidoscopic, colorful, often disturbing imagery I'd always associated with India: cows meandering along sidewalks; a kid with a stump leg begging for change from a passing three-wheeled auto-rickshaw; a boysenberry mosque rising dreamily from the bay; carts filled with lumber, chickens, or vats of milk; a wall painting of the blue-skinned Hindu deity Krishna next to a bright-red Coca-Cola ad. Goa, however, resembled the San Diego suburb of La Jolla, which is the site of the Chopra Center for Well-Being, a plush spiritual spa and Chopra's home base. Cliffs wound down to empty beaches, where the blazing sun disappeared nightly like a copper coin dropped into a pocket. The resort itself was more Caribbean than Californian, with pink, vanilla, and butterscotch-yellow villas, palms and banyan trees, and a paramecium-shaped swimming pool. The "experiential odyssey" had drawn about 175 participants from 23 countries (mostly from the United States and Australia). I started meeting other guests gradually, accidentally, tentatively. I bumped into Ryan, the daughter of an American model, when I first stepped into my coconut-dotted yard— she was walking by, wearing white Prada pants and using a postcard of Gurumayi, the female leader of the Siddha yoga movement, as a bookmark. Sidling down to the pool, I met Michael, a bass guitarist and backup musician for Australian rocker Jimmy Barnes. Barnes, who's sold 10 million records worldwide, was also hanging about, having been put up to the venture by Jane, his Thai-Australian wife and a fan of Chopra's. Events were held in a chic tent on a cliff overlooking the sea, where we could hear waves breaking, crows cawing, Jet Skis zooming. Palm trees wrapped in saffron-and-white-striped cloth acted as tent poles. The flapping roof was composed of colored sheets with repeating mandala designs in red, green, blue, and turquoise. Bamboo shades could be raised or lowered according to the encroachments of the sun. Pale-orange and scarlet burlap rugs were spread on the ground. On one side of the tent hung seven purple banners emblazoned with Chopra's Seven Spiritual Laws of Success ("Least Effort," "Giving," "Pure Potentiality"); on the other side were seven red pennants advertising concepts from his latest book, The Path of Love ("Infatuation," "Passion," "Ecstasy"). Having adopted the casually rich look of a successful Hollywood producer— cream-colored polo shirt, black jogging pants, and silver Nikes, his Krishna medallion tucked under his shirt— Chopra immediately displayed his knack for bumper-size bons mots. 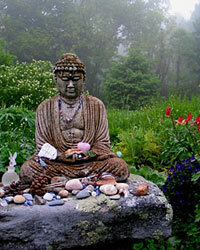 "Meditation is plastic surgery for the soul," he told us the first morning. "The word enlightenment means 'lighten up,'" he said in another session. Our goal was to be "getting in touch with our karmic software." I clocked him in one 10-minute stretch zigzagging from Einstein to Robert Frost to Saint John of the Cross to "one of my favorite authors, H. G. Wells" to William Blake to the Rig Veda to findings in the New England Journal of Medicine on "psychological stress and susceptibility to the common cold." As in a daytime talk show, these performances were followed by Q&A's with a roving mike, during which the audience revealed itself to be full of doctors— a surgeon from Baltimore, a dentist from Norway, a gastroenterologist from India. The Newsweek-cover-come-to-life ("Spirituality for Sale," October 1997) was able to mingle without letting his New Age aura slip too precariously— either at formal book signings, or when relating loose anecdotes during lectures, or sitting down with guests at meals. For instance, at our one-on-one lunch of lentil dal over white rice with diet Cokes, Chopra reminisced casually about his days with the Maharishi Mahesh Yogi, the white-bearded muse of the Beatles, whose TM movement Chopra had promoted after leaving his medical practice. The heart of the workshop, however, is meditation, and by the end of the week we were managing four to five hours daily. Exhibiting his flair for airbrushing Vedic tradition with modern scientific lingo, Chopra dubbed these practices Advanced Psychophysiological Techniques. To qualify, you received a parchment card from an instructor, inscribed with your confidential mantra based on the time and date of your birth (my own contained a Sanskrit word distractingly close to the word chipmunk). You then learned to synchronize the mantra with inhalation and exhalation, trying to dispel the usual pesky thoughts nipping incessantly at your mind. With everyone cross-legged on white plastic chairs, or splayed on blankets, we must have looked as if we'd been totaled by the human equivalent of bug spray. By the last day, I'd actually experienced a few hits of what was promised in the sixties to be a "natural high." After so many hours of breathing in Darth Vader patterns, I found myself walking toward the sea with a zombie's gait and an as-good-as-it-gets sensation in what Chopra calls the fourth chakra and I call the heart. Similar to a 19th-century revival meeting, this spiritual hoedown offered all sorts of alternatives for revving up or chilling out. There were early-morning outdoor yoga classes, during which the sky modulated from black to violet to blue. Afternoons, booths were manned by a complimentary pulse diagnostician and palm reader, as well as a "Vedic Astrologer" doing readings at $100 a pop. (When I asked Chopra if he'd had his palm read, he replied, "No, I don't believe in all that.") Women could have hands or feet tattooed with henna— the stains last a week or two. Free Ayurvedic treatments of nose and eye drops and the freaky application of a paste to whiten the whites of your eyes were offered in a sort of large infirmary tent. Meals were similarly full of color, smorgasbords of Goanese cuisine (an edgy mix of European, south Indian, and west Indian cooking): whole pomfret stuffed with red-hot spices; grilled kingfish in coriander; cauliflower mixed in a thick paste of curd, potatoes, and green curry; red-papaya salad; coconut soufflé; chocolate pancakes; honey-and-ginger pudding; and lassi (a curd drink with sugar, salt, or fruit). Come nightfall, we pilgrims usually watched local entertainers playing sitar, dholak, and harmonium, or performing a traditional kathakali dance. One evening Chopra invited us to lie like teenagers, blindfolded next to speakers, and listen to a preview of A Gift of Love, his CD of recitations from the 13th-century Sufi poet Rumi, with cuts by Madonna, Demi Moore, Rosa Parks, Goldie Hawn, Martin Sheen, and Chopra himself. (It's being released November 3 on Rasa Records.) The project had grown out of a 1996 Seduction of the Spirit week in Colorado, at which a Rumi translator chanced to be present. Madonna picked up his manuscript of translations in Chopra's La Jolla office some time later, felt a significant tingle from the poem "Bittersweet," and the rest is spoken-word history. If these activities seemed about as stimulating as shuffleboard, self-help exercises in Subtle Body Clearing could be tougher going, at least for anyone not entirely comfortable with group therapy. On one occasion we wrote down our emotional glitches and then exorcised them by burning the seconds would whisper in our ear "Who are you?" and then "What are you doing?" (I was reminded of the scene in Sphere where Sharon Stone E-mails an alien, "What are you doing?" It types back, "We are travelers on a cosmic journey," to which Stone's partner comments, "Sounds like Deepak Chopra!") Sessions tended to climax with middle-aged free spirits dancing to Boy George's version of "Hare Krishna." At such moments there was always the chance to escape to Goa itself, an eccentric region with as many churches as temples and mosques, its own local language (Konkani, an Indo-Aryan offshoot of Sanskrit), and a decades-long history of catering to hippies, rock bands like the Rolling Stones, surfer dudes, and stoners. I wanted to sample one of Goa's famous raves— under a full moon, some 5,000 kids gather on the beach to groove to techno music— but unfortunately the moon was only a sliver, and the party hadn't yet begun. Indian women were nonetheless bearing large amplifiers on their heads, making their way down steep passes to a thatched DJ booth set among a clump of dark silhouettes of tall palms. At lunch on the last day, an obstetrician from Pennsylvania summed up the effects of a week at meditation camp. "On vacation I always want to be active," he said. "I need to accomplish a whole checklist of activities— running, fishing, hiking— to feel good. Meditation turns out to be the perfect relaxing vacation, because you're always doing something. Even if it's sitting doing nothing." Seduction of the Spirit seminars are roving affairs: last year's were held in Goa and Asheville, North Carolina; plans are under way for a 1999 incarnation on the Gold Coast of Australia. The fee for Goa was $2,495, including meals, but not accommodations or airfare. For more information, call the Chopra Center for Well-Being at 888/424-6772 or 619/551-7788, fax 619/551-7811.